It is a Sunday evening. Thoughts have been stirring in my heart since this morning’s church service. Our pastor has been preaching for quite some while through the book of Matthew. Today we arrived at Matthew 19, where the Pharisees approached Jesus to test Him with the controversial subject of marriage and divorce. Of course, Jesus, in all His wisdom, could never be trapped in their deceptive questions. Instead, He returned to God’s original design in the creation of marriage. Our pastor proceeded to preach on God’s intent in marriage. Now, I need to say that the subject of marriage is not new to me. For many years, I have studied what Scripture says, have written studies, have taught classes, and have spoken to ladies’ groups on this very subject. So what was it in today’s message that grabbed my heart and thoughts so strongly? Simply put, our pastor emphasized how selfishness causes problems in every marriage, and specifically in every troubled marriage. He explained that we focus on our spouse’s faults and our wants/needs. But then, he described how when we get closer to the Lord and He works in our hearts, we begin to see our faults and our spouse’s needs. How profound! …. And I know that is exactly how the Lord worked in my own marriage. But here is where my thoughts traveled today. Through many years I have walked beside Christian women struggling in marriage … struggling to be the wife that the Lord designed and desires them to be. I myself have struggled there many times. But today, I thought of what a fine line (but with a dramatic difference in result) there is between a focus on ME being a good wife or on MY HUSBAND and the needs that he has. Focusing on HIS NEEDS completely takes my focus off MYSELF! We know that in this life, we are called to deny our self and follow Christ. We also know that when we walk in the truth of loving one another, it is a sacrificial love, doing what is truly good for the other, no matter the cost, expecting nothing in return. Now, let’s take this truth into the marriage. Let us not keep our focus on what kind of wives WE ARE. We may end up downcast and discouraged, or worse, we may end up in pride, thinking we are a much better spouse than others, even better than our husbands are to us! Rather, may we look first to the Lord and His perfect word and way. And then focus on the man that we call husband … and his needs, rather than our own! It is not good that the man should be alone. I will make him a help meet for him. So … Lord, please … help me focus on truth … on “for him” … on his needs … not on his faults …and not on my self! … And let the wife see that she respects her husband. Have you ever heard someone use the phrase: see to it? What did they mean when they said to see to something? Perhaps that is an unfamiliar phrase to some, but the phrase means: to be careful or certain to do something. Our Lord commands the wife to see to it (to be careful or certain) that she respects her husband. Respect – will be our next building block for the wise woman who builds her house. What exactly does the word respect mean? Respect is an intangible word and is not easily defined. Webster’s dictionary defines respect as: esteem, honor, or high regard for a person or their position; deference to another’s position; proper acceptance, courtesy, or acknowledgement of another’s position. Respect is a heart attitude toward another that honors his position. If the heart attitude is respectful, then respectful behaviors will follow. Respectful words will be spoken, and respectful actions will flow from the heart. Through our words and actions, we will esteem our husband, honor him, and highly regard him. We will defer with a proper acceptance and acknowledgment of his position and interact with courtesy and graciousness toward him. Now, let us return to our scripture in Ephesians 5. Let the wife see that she respects her husband. This respect for our husband is something that we should be careful to maintain. Why does the Word of God give this strong command to the wife? We can recall in Genesis 2 that the purpose for the creation of the woman was to be a help/companion to the man. He was created first, and she was created for him as his helper. Now look at the beginning of the Ephesians passage to which we are referring. In verse 23, we find the truth: For the husband is the head of the wife, as also Christ is the head of the church … In truth, there is one reason, and one reason alone, that a wife is to see to it that she respects her husband. That reason is the Lord. He designed, created, ordained, and commanded it to be so. Our Lord is the Ultimate Authority over all, and it is He Who has delegated authority to the husband. Respect will be necessary for the wife to be a proper help and companion to the husband. We usually stumble at this truth for one of two reasons (or perhaps both). We view our marriage with earthly eyes and think too little of our husband (disrespect) or too much of ourselves (pride). You see, God doesn’t list all the husband’s strengths and weaknesses to see if he qualifies to be the head and deserves our respect. He doesn’t say that the husband must earn our respect. He commands the wife to respect him because He has created the husband to be the head, and therefore, the husband’s position as head is to be respected. We all have a fallen human nature, including our husbands, but we cannot allow our earthly view to cause us to dismiss the truth of the Word of God. the head of the woman is man, and the head of Christ is God. Every wise woman will grab hold of this truth and not let go! The husband is the head of the wife, and Christ is the Head of the husband. Our husband has a Head, and he has a Perfect Head! AND, through prayer, the wife has the privilege of directly communicating with her husband’s Head. Anytime we have difficulty respecting our husband’s position as our head, in the final analysis, we are having trouble trusting God to work good for us through our head (our husband). We are actually questioning the goodness of God! Remember, the question is not whether, according to our evaluation, our husband deserves to be the head. It is our Loving, Faithful, All-Wise, Heavenly Father Who has appointed our husband to that position. For the husband is the head of the wife as Christ is the Head of the church. Christ and the church serve as our example of how a marriage is to be lived out, AND when we live according to these truths, we reflect the picture of Christ and the church, and our Lord is glorified! Now, I already know what many wives may be thinking. Thoughts like: You don’t know my husband! Or But my husband doesn’t love me like Christ loves the church! This is where faith comes in. Our responsibility is to see to it that we respect our own husband as our God-given head, in humble obedience to the Lord Himself. It is the Lord’s responsibility to work in the life of our husband. Even if a husband is an unbeliever or an unspiritual man, our only responsibility is to respect his position as the church would respect he Lord. Will our husbands ever achieve the perfection of the Lord? No, not in this life, and the Lord knew that when He set this truth in order. But He also knows that a wife who will walk in this truth will reflect much glory to Him! You may also ask: Am I honoring and respecting my husband instead of the Lord? The answer is: No, you are honoring and respecting your husband because of the Lord. Truly, God’s ways are far above ours! Our fleshly thoughts and ways can never attain to such a high calling. But God, through His Spirit, can and will work these truths in us. to respect (esteem, highly regard, honor) her husband as her head. Not long after I became a Christian, the Lord drew me into His Word to study marriage. (That is because I needed it so badly!) I came across the truth that the husband is to be the head. Like most Christian wives, I did want my husband to be the head of our home. I wanted him to be the head of our son, and to discipline him when needed. I wanted him to handle the finances and things like insurance. I wanted him to handle problems that would arise, but what I discovered in the Word of God was that I had missed the most important part of this truth. What the Lord showed me was that the husband is the head of the WIFE! What I saw was that I wanted my husband to be the head of our home, but I did not want him to be the head of ME! Through much prayer and meditation on these truths, what I discovered was that I honestly didn’t think I needed a head. I was a mature, intelligent woman. I really didn’t need a head – or so I thought! I could see that our son needed a head. I had taught school for several years and could see that my students needed a head. I could see that citizens need a governing head, and I could certainly see that my husband needed a head. Why was I so blind to the fact that I needed a head? Oh, this fallen human nature! I also struggled with the need of a human head. I thought: Why can’t the Lord just be my Head? Why should this man be my head? What the Lord showed me was that all human beings (including me) need authority, and it was He (not my husband) Who had designated this order. He also showed me that He would use my husband for my good. And, oh my, how this has proven to be true through the years. The one truth that I resisted so strongly has turned out to be one of the greatest blessings of my life. I can assure you that respecting a husband as the head of the wife does not come naturally. The Lord must do the work in the wife. Yet, He commands her to see to it that she respects her husband. In my life, I had to take that truth to the Lord in prayer and allow Him to change my heart. I also had to refuse the lies of the enemy that said that other people had it “easier”, and that this would never work in my marriage. What a transformation the Lord brought to my marriage through this truth, and in years to come, what a transformation he made in my husband! God’s Word is always truth, and His way is always from His goodness! Oh, that we could learn to bow our hearts to Him! Spend time with the Lord on these truths. Perhaps these questions will prove helpful as we examine together. What is our heart’s attitude toward our own husband? We will experience much frustration (and failure) if we attempt to be respectful to our husband on the outside and do not respect him from the heart. What can we tell about our heart toward our husband by the way that we speak to him? How do we respond to his requests? How to do we speak about him to others? How do we speak to and about him in front of the children? Are our private thoughts about our own husband respectful ones? From the heart, do we respect him as the Lord calls us to do? Ask the Lord to help. Faithful is he Who calls you, Who also will do it. and be joined to his wife, and the two shall become one flesh. We have been looking at God’s creation of the man and the woman, His design and His intent, as He created them and joined them into one flesh. We will continue to discuss this amazing truth today. It may seem that we are jumping ahead to the New Testament and leaving the Creation account found in Genesis, but that is not the case at all. Before we begin, please take the time to prayerfully read Ephesians 5:15-33. The Apostle Paul writes a beautiful exposition on walking in wisdom and being filled with the Spirit, and then applies these truths to the Christian husband and wife. As he concludes his spiritual instruction for the husband and wife, he quotes our passage from Genesis about the husband and wife becoming one flesh. Then he declares that this is a great mystery, but he is speaking concerning Christ and the church. In the New Testament, the Apostle Paul frequently used the word mystery as he refers to the church. (You can use a concordance to search out those scriptures if you like.) A mystery was a secret, hidden truth, which remained hidden until God revealed that truth. The Old Testament saints did not understand the church as God revealed it in the New Testament. We discover so many truths in a much deeper way as Jesus revealed them, and as the Apostles also expounded them. Truths that were hidden were a mystery, but at God’s appointed time, they were revealed by Him. This is the type mystery to which the Apostle Paul is referring. Specifically, He is referring to the one flesh relationship, “bone of my bones and flesh of my flesh” – one flesh. We know that this quote comes from Adam’s declaration about the woman as the Lord gave her to him, and we know that they were joined as one flesh. But in the passage that we are considering, the Apostle Paul is explaining the proper relationship between the husband and the wife. He uses, as his example and explanation, the relationship between Jesus Christ and the church (His bride). And in this explanation, he refers to one flesh, bone of his bones, flesh of his flesh, members of his body. Truly, it is a great mystery! What exactly is the Apostle Paul saying? Is he referring to Adam and Eve? Is he referring to a husband a wife? Or is he referring to Christ and the church? Let’s take a look at all three! Adam and Eve: In a very literal sense, Eve was flesh of Adam’s flesh, and bone of his bones. God had literally formed her from his flesh and bone. Therefore, she was named Woman. Remember? There they were joined as one flesh. This passage is true of them – literally. Can you see how the husband is to view his wife as his own body, “flesh of his flesh, and bone of his bones,” and love and care for her as such? And the wife, too, must learn to view herself as a part of her husband. For the Word of God says he is the head. She is a part of him. They are one flesh! So, it is now a symbolic truth, first literally seen in the creation of Adam and Eve, but now one which shows a husband and wife how to live to the glory of God, and one which produces very real results in any marriage where the husband and/or wife is willing to believe and trust the Lord so as to walk in truth! And one further note, when we humble ourselves and walk in this truth, we reflect Christ and the church, others will see the reflection (especially our children), and we bring much glory to the Lord. Christ and the Church: The relationship between Christ and the church is given as the example to the wife for the rightful headship and a proper response to her husband as head. The husband looks to the example of Christ to understand the wife as a member of his body and how to properly love and care for her. Wow! Amazing, high and holy truth. So, does one flesh, ”bone of my bones and flesh of my flesh” also apply to Christ and the church? Absolutely, yes. For He is now the Head of the church, and we are members of His body! And one day, He will return to this Earth to get His bride, and the fulness of this mystery will be complete. Deep spiritual truth that our mind struggles to comprehend, but absolute truth of the Word of God. It is a spiritual truth. A great mystery indeed. So, in conclusion, let us return to our Genesis passage of God’s creation of the man and the woman, the creation of Adam first, the creation of woman from flesh of his flesh and bone of his bone, and the joining of the two into one flesh. In His unsearchable wisdom, God was creating humankind and woven into that creation was a great mystery, not only a pattern for all marriages to follow, but a glorious picture of the beauty of Christ and the church, which was yet to come. We should all stand in amazement! I shared with you that when David and I were married we remained as two individuals. God had joined us as one, and He viewed us as one, but we had no idea what we had really been called to. I made every mistake imaginable (and so did David), but the Lord taught me to take my eyes off David and all his faults, failures, and sins, and concentrate of being the wife that God had called me to be. And that was a tough job! However, in the final analysis, what I learned is that God blesses His Word. When I stopped arguing with God, defending myself and my “rights”, going my own way (whether blatantly or manipulatively), and then bowed before the Lord in humility and honesty, God was faithful to forgive all my mistakes, refresh my heart and mind, and give me the grace to press on. I found that a very close walk with the Lord was the only answer. In and of myself, I would always go astray and go my own way, thinking that my way would produce a better result. How foolish of me! Over and over the Lord would bring me back to the truth of one flesh. Over and over the Lord would bring me back to the truth that He had given David to me as my head. Over and over He would remind me of the picture of Christ and the church. I remember when the question occurred to me: What would it look like if the church declared that she would be “her own woman” and that she didn’t need a Head? Oh my, what I must have looked like to my Lord! I was independent. I acted apart from my husband. I sometimes opposed him, but I also cleverly tried to manipulate him to get my way. I cannot emphasize enough that the Spirit and the flesh are contrary to one another. My flesh will ALWAYS pull me away from truth. We are only able to walk where God calls us to walk by His grace and by His Spirit. When we stumble (and we will), we go back to the Lord. He will lift us up! My journey has not been an easy walk, but it is one that I would not trade. The more I walk in one flesh with my husband, viewing myself as a part of David, and viewing him as my head, the more the Lord blesses our marriage. Neither of us are the same as we were 40 years ago as we entered this marriage, and neither of us would go back to our old ways. Why? Because there is a joy now that we did not know when we were independent of one another and insisting on our own ways! All I can say is that we are a walking, breathing testimony that God blesses His Word. So, I beg you, don’t be afraid to walk in truth. I know it is not easy. I know all the arguments, fears, and doubts, but I also know the joy that the Lord will bring. None of us are yet perfected, but may we continue to press on, that we may lay hold of that for which Christ Jesus has also laid hold of us … all for His glory! In truth an honesty before the Lord, examine your life. If you are married, how do you view you and your husband? Do you live as one flesh? You will have to give your husband fully to the Lord in prayer, no longer pointing out his faults and failures as excuses for your actions. Seek the Lord. Ask Him to renew your mind according to truth. Ask Him to show you the things that you need to change. Be willing to take one step at a time, obedient to what the Lord shows you. Trust the Lord as you walk by faith in His Word. Every wise woman – will seek to honor the Lord in her marriage. Today we will return to God’s creation of the man and the woman. You will recall that the man was created by the hand of God from the dust of the ground. You will also recall that God caused a deep sleep to fall upon Adam, and then God took a rib and formed the woman from the rib and brought her to the man. We now see Adam’s delight as he exclaims that the woman is bone of his bones and flesh of his flesh. He then names her, giving her an identification: She shall be called Woman because she was taken out of Man. It is again important to note that God never intended the man and the woman to function as two separate individuals. From their very creation to the naming of the woman, we can see they were intended to be one. But let us continue in the Scriptures to further understand this truth. Clear instruction is now given that a man shall leave his father and mother and be joined to his wife, and they shall become one flesh. Again, we see there was no intent in the creation of the man and the woman for them to function as two distinct individuals. There were to be joined into one flesh. There are two simultaneous steps taken as two people get married. First, they must leave. The word leave means: to loosen, to relinquish, to depart from, to forsake. They must leave their individual families as their primary relationships. Secondly, they must cleave – be joined one to another. The word joined actually means: to stick to, to cling to, to adhere to, to stay close to. And as Adam and his wife were joined into one flesh, we find that they were naked and were not ashamed. There we find the beautiful culmination of God’s creation of the man and the woman. Together they were one flesh, not ashamed, and in perfect harmony! What a beautiful picture! And remember, as God looked at His creation, He declared it to be very good. His perfect design was complete! All designed according to His great wisdom! But there is so much truth to be found in this passage that I wonder if we could ever reach the depths and heights of it all. In Matthew 19 and Mark 10, we find the Pharisees coming to Jesus to ask a controversial question, hoping to divide the followers of Jesus. They ask Him about divorce. Rather than answer their question directly, He brings them back to the truth found in the Creation. He answers them by saying: Have you not read that He who made them at the beginning made them male and female? And He said: For this reason, a man shall leave his father and mother and be joined to his wife, and the two shall become one flesh. So then, they are no longer two, but one flesh. Therefore, what God has joined together, let not man separate. From Jesus’ words we can see several important truths. First, the truths found in Genesis 2 regarding the man and the woman apply to every married couple. Jesus makes that application here as He goes back and quotes God’s intentions from the Creation. He establishes that each of those truths are still true today. Next, notice what He says: What God has joined. What God has joined! When a man and woman are joined in marriage, it is God that joins. That is why He can declare with authority: What God has joined, let not man separate! God intends a marriage to be permanent, for He is the One who has joined a husband and wife, and not we ourselves! We will look at the one flesh union again in our next writing, but for now, let us continue to think upon the truths set before us – God designed a husband and wife to leave their individual families and be joined by Him into one flesh. No longer two, but one! As of this writing, my husband and I have been married almost 40 years. We had a church wedding, and these verses were read at our wedding, as they may have been at yours. But I had absolutely no idea of the truth of these verses. David and I entered our marriage as two individuals, and quite honestly, we continued in our marriage as two individuals. Certainly, there was the physical, intimate oneness, and even a friendship, but our lives were still very independent of one another. He had his ways; I had mine. He had his job; I had mine. He had his schedule; I had mine. I suppose you can understand why I said we were still two individuals. It actually never entered my mind that God intended us to function as one. And I wouldn’t have even known where to begin. I’m sure my beginning would have been to get him to come over to my ways. But God had much higher, bigger, and better plans than I could ever have had. He began to teach me about one flesh, bone of his bones, flesh of his flesh, and spiritual truth I had never known in my life. The journey continues … 40 years of marriage … still learning to be one flesh with my husband … all to the glory of God! There are no quick fixes, nor easy answers, but we will talk more about that next time! Lots of truth to meditate on and pray through! Every wise woman – seeks God’s wisdom for her life! So then, they are no longer two, but one flesh. A special note written with much love: If you are struggling in your marriage or find yourself as a divorcee, please don’t leave truth. We are just beginning this journey, and God has wonderful answers in His Word that only He can open up to you. Don’t give up! Keep seeking Him! He has a perfect plan for your life, and He is faithful to His children! The year was 2017. The diagnosis was bilateral invasive breast cancer. The events of the year were certainly unexpected and unpredictable, but the Lord, in His faithfulness, love, grace, and mercy, carried us through by His amazing strength. As of today, following much prayer, many doctors’ appointments, and two surgeries, as far and we know medically, my body is cancer free. But 2017 also brought some other things into my life. We all know that the Scriptures teach that our life is but a vapor and will fade away. We know that it is appointed to each of us a time to die, and we know that our days are numbered. But 2017 brought a time of examination into my life. With a clear view that my life could have ended here on earth, I had to ask the Lord what He would have me do with the future days that He has graciously placed before me. The Lord has so blessed my life through His Word over the last 33 years. He saved me, totally changed our marriage, helped me raise our son, taught me so many truths, and essentially gave me a new life. I cannot keep these blessings to myself. I must share them and allow the Lord to bring them into the hands of those who need encouragement in truth. I also leave these writings, with great love, to the next generation. So … for 2018, I have been led to write devotional posts entitled Every Wise Woman. Simple devotional thoughts will be written to encourage women in their walk with the Lord, in their marriages, and in their homes with their families. We will build truth upon truth through these simple devotions. The posts are not already written. I will write as the Lord leads. I do appreciate your prayers. I invite you to join the journey and to invite others to join us, as well. You will be able to find these posts on our blog at http://www.wisdomandkindness.com and can follow the blog there to have the posts sent to your email address, or you can have them show in your Facebook feed by liking our Facebook page entitled Wisdom and Kindness. Looking forward to the journey. Praying that you will join us. May the Lord bless! God has painted a most beautiful picture of life, as it is intended with Him, in the union of marriage. God Himself chose marriage as the means of portraying this spiritual truth. Marriage was neither designed nor instituted by mankind. Neither can it be changed by mankind. What was the great spiritual truth that God was portraying as He formed the man from the dust of the ground and then formed the woman from the man’s own rib? What was the significance of God bringing the woman to the man and the two becoming one flesh? And, very importantly, how can a Christian marriage aptly reflect these great truths? One important observation that should be made by the one that believes and loves God’s Word is that this picture of marriage is found both at Creation in Genesis (Genesis 2:18-25) and in the closing chapters and verses of Revelation (Revelation 21:2,9; 22:17). In the very beginning of the Bible, we find God creating a man and his bride. At the very end of the Bible, we find the God-man, Christ Jesus, coming for His bride. Perhaps we would not have the spiritual eyes to link the two truths, but the Apostle Paul sheds great light upon these truths in Ephesians 5. As the Apostle was exhorting and instructing the believers at Ephesus in very practical ways that husbands and wives should treat one another, he uses Jesus Christ and the church as the example. 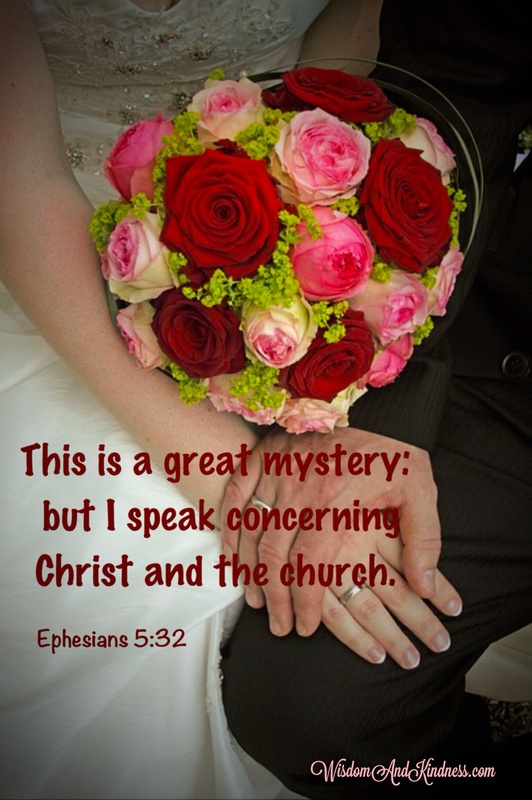 In his explanation of the proper relationship between a husband and wife, he says: This is a great mystery: but I speak concerning Christ and the church (Ephesians 5:32). A mystery was that which could only be made known by divine revelation. It was a truth that was hidden or covered until God Himself revealed it – at His appointed time. The word mystery can be understood in the context of Colossians 1:26: Even the mystery which hath been hid from ages and from generations, but now is made manifest to His saints. In the same way, the Apostle Paul says that this mystery of marriage concerns Christ and the church. As Christians, therefore, we should humble ourselves before the Lord asking that He help us understand this mystery which He has revealed in His Word. God has chosen to demonstrate, in a visible way, the spiritual truth of Christ and the church. And that visible demonstration is to be seen in marriage – in the relationship between a husband and wife. For the Christian, this truth has tremendous implication as to how we are to respond to our own husband or to our own wife. How often do we consider that our day-to-day functioning as husband and wife can bring much glory to the Lord, or actually cause His name to be blasphemed (Titus 2:5)? Let us consider a few parallels between God’s institution of marriage and Christ and the church. – Adam was formed first, then Eve (Genesis 2:7). Christ was existent long before the church became His bride (Colossians 1:16-17). – God caused a deep sleep to fall upon Adam, so that his bride could be taken from his side (Genesis 2:21). It was through the death of Christ that the church was brought forth. He was pierced in His side (John 19:34). – Adam called Eve bone of his bone and flesh of his flesh (Genesis 2:23). Regarding Christ, the church is called members of His body, of His flesh, and of His bones (Ephesians 5:30). – Just as God joined Adam and his wife into one flesh (Matthew 19:4-6), Christ and the church are joined into one flesh, as the believer becomes a member of His body (Ephesians 5:30). – Interestingly, the Scripture teaches that Adam was not deceived, but the woman was deceived (1 Timothy 2:14). Similarly, Christ was not deceived, as He came and paid the sin debt for his bride (John 18:11). – Traditionally, a bride was bought with a dowry. Christ bought and paid for His bride. For ye are bought with a price (1 Corinthians 6:20). – God brought the woman and gave her to Adam (Genesis 2:22). A bride was traditionally given in marriage by her Father. It is the Father that gives the church to Christ (John 18:9). – A bride traditionally gave up her identity and took the name and identity of her husband. The Scripture teaches: Male and female created He them; and blessed them, and called their name Adam, in the day when they were created (Genesis 5:2). Likewise, the Christian should leave the old life behind and take upon the identity and name of her new Husband. Listen to this beautiful analogy in the Psalms: Hearken, O daughter, and consider, and incline thine ear; forget also thine own people, and thy father’s house; So shall the king greatly desire thy beauty: for he is thy Lord; and worship thou him (Psalm 45:10-11). – In marriage, God joins the two together (Mark 10:8-9). In salvation, the believer is joined to the Lord (1 Corinthians 6:17). – As the marriage is consummated, the wife gives herself to the husband, and the husband comes in unto her. In salvation, the believer gives herself to the Lord, and He, through the Holy Spirit, comes in unto her (Romans 8:9) . – The intimacy between a husband and wife should continue throughout their lives. The intimate relationship between a believer and the Lord will continue throughout eternity (Revelation 21:2,3). – The husband and wife are to forsake all others and be faithful unto death (Romans 7:2). The Lord has said that He will never leave us nor forsake us (Hebrews 13:5). The church is to forsake all else and be faithful unto death (Revelation 2:10). – The husband is to be the head, and the wife is to be a member of his body (Ephesians 5:23, 31). Christ is the Head of the church, and the church, collectively, are members of His body (Ephesians 5:30). – The husband is to love the wife (Ephesians 5:25). The wife is to respect her husband and arrange herself under his authority (Ephesians 5:24,33). Christ loves the church with a perfect love, and the church is to respect and reverence Him and to arrange herself under His authority (Ephesians 5:24-25) For this cause shall a man leave his father and mother, and shall be joined unto his wife, and they two shall be one flesh. This is a great mystery: but I speak concerning Christ and the church. Nevertheless let every one of you in particular so love his wife even as himself; and the wife see that she reverence her husband. We have lost much of the beauty of marriage. It is a relationship as no other. It is the relationship that God Himself has chosen to reveal the mystery of Christ and the church. As those around us view our marriage, they should see a picture of Christ and His church – because God has chosen that relationship to reveal His truth. May the Lord renew our minds and hearts that we may see our marriage as He sees it. Then, may we guard carefully the beauty and the mystery of marriage. to whom be glory forever.